VIEW MORE ABOUT TEMPLE SQUARE HERE. 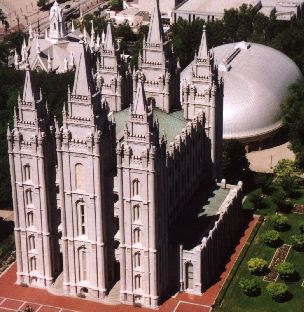 Temple Square in downtown Salt Lake City is one of Utah's most visited spots for tourists. To view all the buildings that are a part of Temple Square, CLICK HERE for an interactive map. Hover over the buildings, and they will tell you information about that specific building. Temple Square is great in the fact that you can take a self-guided tour, or ask one of the ever-present tour guides to show you around. To go on a scheduled tour with a tour guide, CLICK HERE for information on what tours are available, and what times they meet and where. Christmas is also an excellent time to visit Temple Square, as they are famous for their extravagant display of Christmas lights and live nativity scene. One of our favorite things to do is go to the very top of the Church Office Building (On THIS MAP, the Church Office Building is the tallest buidling), as there is an observation deck where you can see the whole valley and downtown. There is a lot to see, so make sure you plan plenty of time for walking around! End your day off by relaxing and enjoying a picnic lunch or dinner in nearby Memory Grove Park.